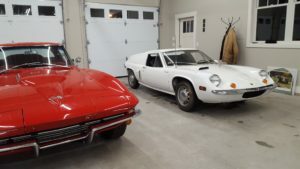 ”A new project in the Atsma garage. 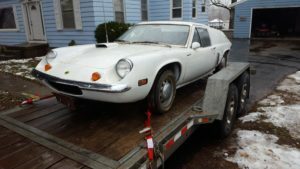 Howard and John Atsma have been chasing a Lotus Europa for about 3 years and finally caught it. 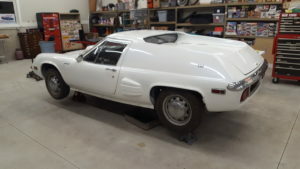 This is a 1971 Type 65 Lotus (Europa) that has been in the corner of a garage in SW Grand Rapids for 40 years. 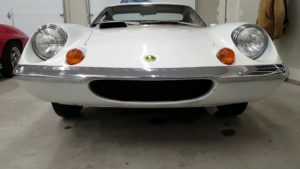 The Lotus is in decent shape with 38k on the odometer. We have started her and confirmed that she will run without smoking and making bad noises. Brakes are original and we have replaced all calipers, wheel cylinders, pads, and shoes. Next is getting into the clutch and transaxle system and get that freed up. Colin Chapman, Lotus creator, is one of my favorite car guys and his philosophy of reducing weight and improving suspensions is appreciated by me. If anyone would like to see what we are doing just give me a call and drop on by.